The North Cape is a 307 meters (1,000 ft) high cliff which is generally referred to as the northernmost point of Europe located on the northern coast of the island of Magerøya in Western Finnmark, Northern Norway. The North Cape is a monumental natural experience, along with breathtaking views and place that every authentic traveller simply has to visit. The bird cliff of Gjesværstappan is the home of hundreds of thousands of puffins, gannets and cormorants, whilst the hike to the natural arch of Kirkeporten offers a quite impressive view of the North Cape. More challenging and even more rewarding is the 5-6 hour hike to Cape Knivskjellodden, where you see the North Cape cliff up close. Go fishing for giant, ugly king crabs, and get to eat the tasty monsters afterward. 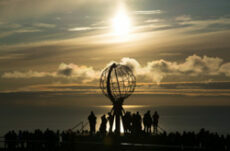 The North Cape is the most northerly point of Norway, and thus enjoys the midnight sun longer than anywhere else in the country – from 14 May until 29 July. However, midnight sunshine is far from guaranteed during this period, as cold and warm currents in the Arctic Sea generate a good deal of fog in the area. This means that it is even more beautiful when the sun hangs high in the sky above a bronze-coloured sea.